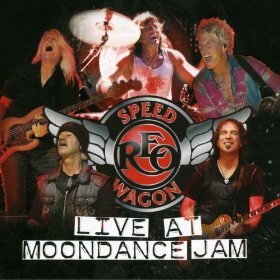 REO Speedwagon’s new CD/DVD, Live at Moondance Jam, features the famous Midwestern-born and bred American rock band in high perfect form. Opening with the hard pop punch of “Don’t Let Him Go,” Neal Doughty’s keyboard lead in the center of this rock-popper begins a solid live show appearance the band recorded deep in the Midwest at a live show in 2011. “Take It on the Run” features a wonderful Dave Amato lead guitar, as does “Keep Pushin’,” which showcases his slide work, while “Golden Country,” an old REO tune, gets played by the band in what I feel is one of the better moments here dropped more or less dead center of the set. Bassist Bruce Hall keeps up the funk perfectly. “Can’t Fight This Feeling” sees vocalist Kevin Cronin in fine form (though this tune is simply too fey for me, especially in light of all this REO rockin’). Drummer Bryan Hitt’s splashy cymbal play opens “Time for Me to Fly” with a double neck lead from Amato and great bass playing (again) by Hall. “Back on the Road Again” sees Hall singing and Amato blistering, and “Roll with the Changes” features Cronin’s piano and Doughty’s great organ leading the way. The CD offers two more songs (though the DVD is just as spectacular, with great onstage moments, close-ups and just enough crane shots over the nighttime crowd’s heads), the band’s infamous “Ridin’ the Storm Out” and the oldest tune played at this show (and a REO fan fave), “157 Riverside Avenue,” showcasing (yet again) the only original member of REO, Neal Doughty. REO rocks on Live at Moondance Jam.